True to its name, the Industrial Workers of the World spanned the globe — an international history that has long been forgotten. IWW supporters in the early twentieth century. Even Americans familiar with labor history might be surprised by the slogan of the Congress of South African Trade Unions: “An injury to one is an injury to all.” More commonly associated with the Industrial Workers of the World (IWW), the motto was likely brought to South Africa by IWW members (“Wobblies”) shortly after the revolutionary union’s founding in 1905. That the IWW was global enough to spread its phraseology across the Atlantic Ocean belies its popular conception, which tends to focus exclusively on the union’s organizing in the US. But the IWW’s revolutionary ideals found purchase among workers throughout the world, eventually gaining members in at least twenty countries on all six of the inhabited continents. The IWW inspired activists in the Ghadr movement, which sought Indian independence from the British Empire. Its members interacted with Chinese republican revolutionaries led by Sun Yat-sen and the anarchists of the Partido Liberal Mexicano as well as its hero, Emiliano Zapata. Its ranks included everyone from socialist tribune Eugene Debs to Ghadr movement leader Pandurang Khankhoje to border-hopping migrant laborers in the American Southwest. A new anthology, Wobblies of the World, explores the IWW’s rich international history for the first time. I recently spoke with coeditor Peter Cole about how the IWW fits into global labor history, what attracted disparate workers to the Wobblies, and why this aspect of the IWW has been overlooked for so long. Our discussion has been edited for clarity and brevity. The IWW was founded in Chicago. How did it grow into an international outfit? Literally from its birth, the IWW was global. Some of those who attended the founding convention brought the message back to their homes in Canada; others, no doubt, started writing to their friends and comrades in their home countries across Europe. IWW materials quickly traveled far and wide. Most importantly, Wobblies were committed to the ideals of their union, so every member, in essence, was an organizer. As they moved around the country and world — for work in the short term and revolution in the long — they brought with them their ideas and newspapers. Aboard long voyages from New York to Hamburg or, say, San Francisco to Shanghai, guess what the sailors had? Time! Time to read and talk and debate and organize. When Wobbly sailors disembarked in every direction, their revolutionary ideals traveled with them. Was the structure and organizing of the IWW identical across countries? No, the IWW was quite anarchic in many senses of the term, including a lack of solid organization. Of course, it was no easy task to organize across the United States — a country three thousand miles across and with many tens of millions of residents. So it’s hardly surprising that the IWW, from its headquarters in Chicago, exerted precious little control or influence in Sydney or Buenos Aires, or even the High Plains of the Dakotas or Saskatchewan to their north. Essentially the IWW in each country operated independently of every other, though they remained in contact via letters, telegraphs, and their many publications, as well as individual members who traveled. Whether this decentralized approach was good or bad can be debated, of course. How much did membership grow as the union spread internationally? Where were the biggest concentrations? Membership grew greatly as the IWW spread worldwide. Alas, the figures for IWW membership are spotty at best. Even in the United States, the numbers are not exact and membership fluctuated greatly from 1905 to, say, 1925. That said, the IWW was strong in many countries in different times, including the United States, Canada, and Mexico. In South America, the IWW had a strong presence in Argentina and especially Chile, as well as among sailors in the Caribbean and across to Spain. The IWW was influential in Australia and New Zealand too. Wobblies influenced unions and organizations in many European countries, including the emerging Republic of Ireland as well as the UK. On the European continent, there already existed anarchist and syndicalist organizations and unions, so there were fewer Wobbly branches despite much interaction. That said, the IWW was influential in some of the Nordic countries, especially Sweden. Despite the IWW’s global history, it is almost exclusively discussed as a US institution. Why? When historians of modern times think about the world, they generally divide it into nations and, far too often, fix their gazes firmly inside whichever one they study. Historians of the United States (and other countries) also face the challenge of “exceptionalism,” meaning the history of the US is unique, one of a kind, and thus must be examined in isolation. Another factor is the limited linguistic skills of many Americans, myself included, which is especially problematic since so many Wobblies spoke and wrote in languages other than English. Time and money, in addition to the issue of reading multiple languages, have made even imagining a global history daunting, to say the least. Truly, an anthology was the best — perhaps only — way to write such a book. What was it about the IWW that appealed to people as diverse as Finnish immigrants in Canada and Maori workers in New Zealand? While no doubt there were exceptions, generally IWW members opposed racism and nationalism because they saw and understood that these forces divided workers to the benefit of employers and to the detriment of those who dreamed of a socialist alternative. 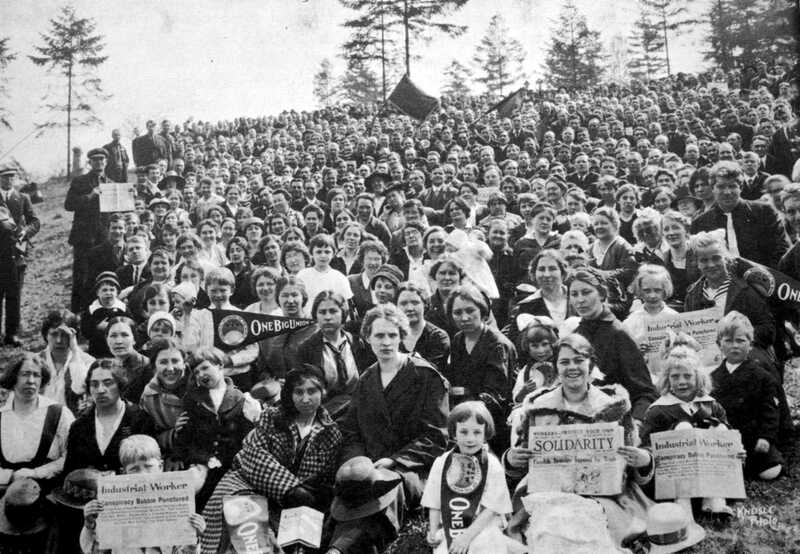 Accordingly, time and again — be it Finns in Canada; Xhosas, Tongas, and other ethnic groups in southern Africa; or the Irish in Scotland — many workers found the IWW’s radical inclusivity appealing. The same also could be said in the United States. My earlier work on the IWW examined how thousands of African Americans allied with Irish Americans and East European immigrants to form a powerful union of dockworkers on the Philadelphia waterfront. Similarly, when the IWW sought to organize farmworkers in California (a group the AFL refused to touch because of its xenophobia as well as its narrow vision of which workers were organize-able), there were upwards of twenty languages spoken on the larger farms. The IWW’s goal was revolution by way of a general strike that would shut down the economy and put workers in the driver’s seat, with the next stop being a world run by and for the people. Thus, Wobblies attempted to organize all workers, be they part time or full time, male or female, in factories or retail. They organized migratory workers, of which there were countless millions — not just farmworkers, but also timber workers and the like. They organized domestic workers and immigrants regardless of legal status. They wanted everyone who was not a boss to be in. In examining the international history of the IWW, we see its many faces, adding to the familiar white and black figures from the United States an entire cast of Mexican, South African, and Indian organizers. Was there a particular individual that caught you totally by surprise? Now that is a tough question, as there were so many, shall we say, colorful characters in the IWW. That said, I think many will find Tariq Khan’s history of South Asian revolutionaries in the Pacific Northwest to be mind-blowing. Although the number of South Asians in the United States in the early twentieth century was small, some of the leaders of the worldwide, anticolonial Ghadr movement were profoundly impacted by their membership in and exposure to the IWW. Pandurang Khankhoje was a leader in the Ghadr movement who joined the IWW after Wobbly timber workers protested that their boss was racist for not hiring him. Subsequently, he became a proponent of the IWW, as he personally benefited from and was educated by antiracist white Fellow Workers (as the Wobblies would refer to one another). He later worked with Sun Yat-sen’s Chinese revolutionaries, the anarchist Partido Liberal Mexicano and Emiliano Zapata during the Mexican Revolution, and then became an agricultural scientist who served as the Mexican diplomat to India after the latter achieved independence. Another personal favorite is Archie Crawford. So many Scottish, English, and other white working-class people traveled throughout the globe-spanning British Empire in the early twentieth century. As the South African scholar Jon Hyslop has noted, a great many of these white workers were racists — even those who belonged to leftist unions and political parties. “White Laborism” was a term used in places as disparate as Australia and South Africa to explain how white workers could embrace socialism and racism, as contradictory as that seems to many socialists today. Yet some of these white workers were committed antiracists, including Crawford. As contributor Lucien van der Walt quotes someone talking about Crawford’s commitment to fighting racism: “More than one time it looked like he would be torn to pieces by an ignorant mob.” Many Wobblies were true believers in the best sense of that term. Wobblies of the World covers such an exciting era for left-wing politics, from the late nineteenth century to the early twentieth century, when it really seemed like the forces of global labor (rather than global capital) were set to reshape the planet. We all know how that story ends, but does the history of the IWW offer particular insight into why it ended as it did? World War I (really a titanic and bloody struggle between European empires) unleashed the Russian Revolution as well as a wave of anticolonial movements, while labor unions of many sorts, anarchist groups, and socialist parties grew rapidly too. For the IWW, World War I proved devastating, as many of its members and branches were targeted for destruction. For instance, in the case of Philadelphia’s dockworkers, the local and federal governments collaborated with employers and the AFL to destroy the most powerful black-led and black-majority IWW branch in the United States. Related to your point about how that phase of world history ended, truly the first wave of government repression, in the United States as well as Australia, targeted the IWW, both during and after World War I. The repression of the Wobblies predicted what occurred to many other anarchists, socialists, and unionists, along with their organizations, after the war — the first Red Scare, as now understood by historians. What is the value of understanding the IWW’s international history? Does this history reveal something important about the nature of socialism? The short version is that the history of the IWW continues to be marginalized. For those reading this interview, ask yourself when you learned about the IWW. Almost certainly, if you grew up in the United States, you were never taught this history. Even if you took a US history course at the university level, say the introductory survey, most likely you never learned about the Wobblies. The same holds for the history of the IWW in many other countries. Utah Phillips, the legendary Wobbly singer and storyteller, provides one explanation. On the album he recorded with folk-rocker Ani DiFranco, he sang of “The Long Memory.” Basically, the history that children are taught in school is “the history of the ruling class, the generals, the industrialists, and the presidents who didn’t get caught.” We are taught “the history of the people who owned the wealth, but not the history of the people who created it.” As a result, Phillips noted, when we go out into the world, we’re not armed with the history of our background and so are not able to understand how to think about our work and lives. For the countless millions who understand that capitalism is bad for humans and the planet, they may not appreciate that another world — a socialist world — is possible. They may have bought into the “end of history” narrative that political scientist Francis Fukuyama crowed about after the implosion of the Soviet Union in 1991 — a world where free market capitalism rules. Fortunately, one need not defend every crime of the Soviet Union or East Germany before advocating for socialism. A century ago, socialists who belonged to the IWW simultaneously chastised the bosses and their political cronies. Wobblies in Cleveland, Wobblies in Auckland, Wobblies in Johannesburg, Wobblies in Dublin, Wobblies in Valparaiso — truly, there were Wobblies who sailed the seven seas to spread the word. This book picks up where they left off.